Thank you for your reply. i update my GraphVar to 1.03. there is no previous error, but a new error occured that when pressing calculate variables and export, the error is occuring. I don't know what's happend? Can you help me again? the error you report occurs as you are using an old MATLAB version that does not support our interactive waitbar. Please update your MATLAB to 2014 or above. actually the programm should detect which Matlab version you are using and switch to the respective commands for enabling parallel computing. Maybe the version identifier also changed with Matlab 2017 ... I will check this if I have time available and rewrite the script (I dont have updated to 2017 yet). From your error post it seems as if you have the parallel computing toolbox. So to solve this quickly, you could uncomment lines 14 - 24 in the script "isParallel.m" under GraphVar-1.03\src\calc. Another (not preferable) option would be to deinstall the parallel computing toolbox. Yes. This worked! Thank you so much. First of all, thank you for your effort to provide a GUI-based toolbox for people with poor scripting abilities like me. 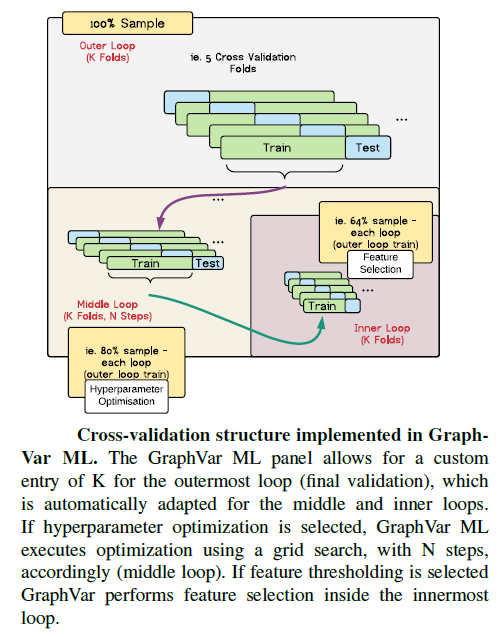 I found a previous comment (dating about 2 years ago) saying that GraphVar can be used for structural data too, but that creation of connectivity matrices relies on other software, as GraphVar has been developed for functional data. 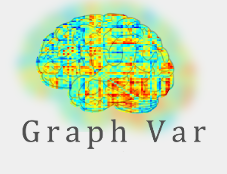 Indeed, I was interested in using GraphVar on DTI and cortical data extracted by Freesurfer. I was wondering if the most recent version of the software now allows to process structural data from the beginning to the end or if connectivity matrices still require other software. In the latter case, have you got any suggestion to extract them in an easy way? You can very well use GraphVar for graph theoretic analyses of structural connectivity data. However, the GraphVar “generate conn matrix” function is specifically written for generating connectivity matrices (nxn matrix) from time series data. Thus, you cannot use GraphVar for generating nxn matrices from structural data. Best would be that you use some other program (e.g. DoDTI or ExploreDTI) to construct a structural connectivity matrix (e.g. a matrix capturing the amount of fiber tracts from region to region) that you subsequently load into GraphVar (for GraphVar the kind of matrix does not really matter as long as it is a symmetric nxn matrix). Once you have defined your nxn matrices you can make use of all the graph theoretic functions in GraphVar. I know that ExploreDTI (http://www.exploredti.com/) has some specific output functions that allow exporting various nxn matrices that can be used for graph theoretic analysis (e.g in GraphVar). Alternatively I think that Mnet (http://neuroimage.yonsei.ac.kr/mnet/) or GAT (http://www.plosone.org/article/info%3Adoi%2F10.1371%2Fjournal.pone.0040709) specifically entail pipelines for graph theoretical analysis of structural data. I used the old version (beta_v_06.2) and tried to use the latest version (v_1.03), but it didn't work. Please help me! Thanks for your help! please remove the old GraphVar version from your Matlab path (i.e., the new version calls some old version of some scripts which have the same name). This should solve the problem. Oh, I got the answer! 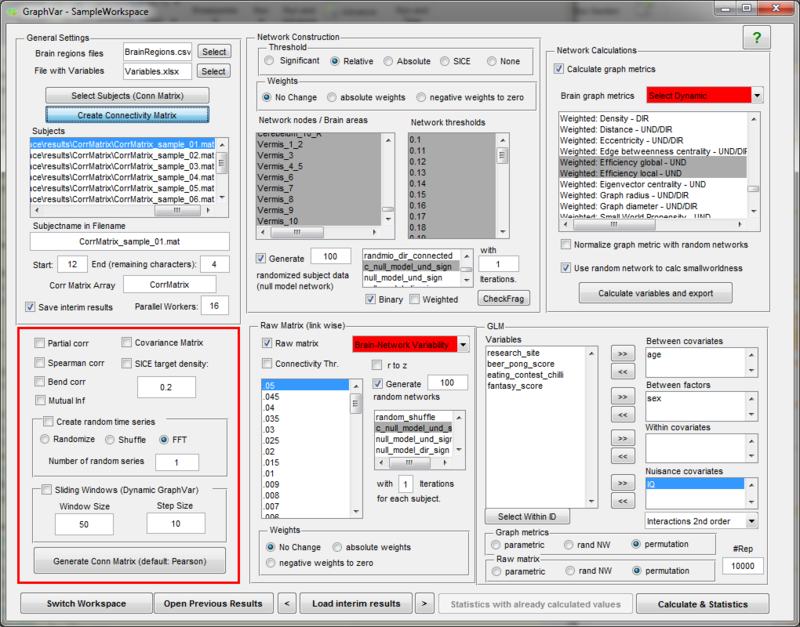 When GraphVar conducted under the Matlab version above 2012, it can work. Hello and Thank you for this amazing tool and support! I'm new to GraphVar and would appreciate any advice or insight! I would very much appreciate some guidance on a (hopefully quick fix!) error I have encountered: regardless of whether I use my own data or the provided sample data, the 'Threshold' box is blank on the Results Viewer (despite having selected thresholds in the 'Network thresholds' and 'Connectivity Thr.' boxes). I originally thought the issue might be with my version of Matlab (2016b), so I updated the program to 2018a and still encounter the error. Any thoughts you have on how to fix this error would be much appreciated! from the error it seems as if the programm does not find the path to the matrix with the p-values that indicate the threshold that you select. Thus, the box is empty. You will have to select the array of reference values as in described in the manual under "4.4. Connectivity Thr.). I had the experience that this error occurs on linux sysrtems more often and not under windows. I apologize if this is a duplicate message - despite refreshing my browser window my comment is not showing up on my screen. If it is a duplicate, please disregard. I would greatly appreciate any insight you might have into the following error: after running through the GraphVar GUI apparently successfully and going to the Results Viewer, there are no thresholds to select in the corresponding box. This occurs both with my own data and the provided sample data. I am using Matlab2018a (I tried it also with Matlab2016b), and GraphVar 1.03. Any thoughts you have on this issue would be greatly appreciated! I would suggest updating to a newer GraphVar version above 1.03. I just checked and there was indeed a bug in the older versions occuring on Linux and Mac systems (windows unaffected) that could lead to an error when GraphVar tried to retrieve the selected thesholds from the GUI. I think that we corrected this already in GraphVar 2.0. If the error still persists in a newer version please let me know. Thanks! I updated to the most recent GraphVar version (2.01b) and it appears to be working! While troubleshooting, I found a presentation online that states that Nan in Signals/CorrMatrix (caused by empty brain regions) will cause calculation tlstsq dgelsd error. However, I have reviewed my correlation matrices and my BrainRegions.xlsx file and have no missing data or invalid values. I am using a Mac, GraphVar2.01b, and MATLAB2018a. Do you have any suggestions to remedy this error? Thank you again for your time and assistance! this error occurs when the GLM model cannot be fit with the data that enters the design matrix. This is rare but most likely to happen when there are some NaNs introduced somewhere in the pipeline. This can be in your input data (e.g. connectivity matrices), the variables sheet or also produced by GraphVar itself when some graph theroretical measures cannot be meaningful computed for particular individuals on the respective networks, or normalization leads to a division by zero. If you are using graph measures, you could have a look in the interim results folder and check if there are NaN graph metrics. A better way to check this, woul be to set a break point in line 514 in the GraphVar_glm script and to inspect Y for NaNs or Inf values (Y are the graph metrics and/or the connectivity matrices). I'll give that a try - thanks! I realized that my previous comment was worded in a misrepresentative and unclear way. I will try to rephrase my question so it is clearer. Thanks for all your support and for creating such a useful toolbox! GraphVar needs real time courses per node [i.e., N time points) x (N nodes)] to compute connectivity matrices. Maybe I do not fully understand your problem but how should it be possible to compute measures of statistical dependence (e.g., correlation) between brain regions if you only have one number per brain region (as you wrote: 1x(N nodes) sized matrix) instead of a vector of numbers per brain region? Thanks for such a useful toolbox and for your prompt responses on this site. I am interested in reporting False Discovery Rate (FDR) adjusted p-values for my analyses. I noticed that, in the Results Viewer, the FDR option says the following: 'FDR - correction (None not applicably) (Parametric)'. Given that it is the only option that says "None not applicably", I want to confirm that this option is functional? I also noticed that it only provides a FDR Corrected Alpha Level for analyses on the Raw Connectivity matrix (and not the graph metrics). I can, however, get a Bonferroni corrected alpha level for all sets of analyses. university Senyang China,I am doing my research in functional brain network.i managed to process rfmri dataset by using dpabi,DPARSF and SPM 12 and successful managed to acquire roicorrelation files of male and female control subjects separately.From there i wanted to calculate network metrics of female and male subjects so as to see the topological differences between male and female control subjects.Foe this case i have used Graphvar v.2.0 but i have encountered a problem that in the stage of statistics&calculate that it cant finish, Please any assistance i will much appriciate.